Actor Nicolas Cage is to provide the lead voice for a new Disney film about ultra-intelligent animal commandoes, according to an industry report. The Oscar-winning star will play a mole who works for a government agency in G-Force, says the Hollywood Reporter. 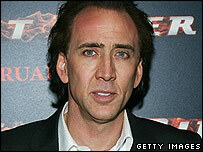 Cage will be joined by Steve Buscemi and comic actor Tracy Morgan who will play a hamster and a guinea pig. The movie, a mixture of live action and animation, is scheduled to be released in 2009. The trio of rodents will be seen trying to prevent an evil billionaire from taking over the world. Production is currently underway in Los Angeles, with Jerry Bruckheimer producing. "It's a good story - it's unique characters, it's half animation, half live action," Bruckheimer told the Hollywood Reporter. "It falls right into the Disney family of films - the kind of films we make, like National Treasure, which entertain everybody from the smallest kid to the oldest grandparent." Hollywood Reporter also said Bill Nighy had signed up to the film, as well as Arrested Development star Will Arnett who is to play an FBI agent.